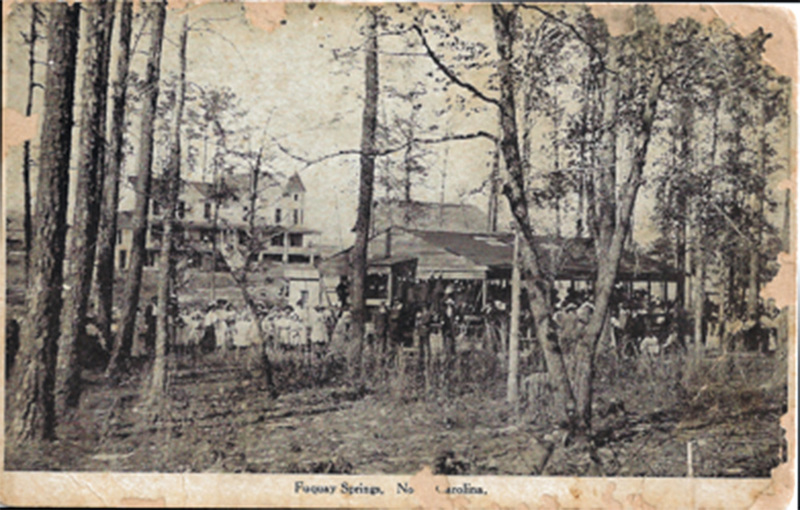 Hotels became important in Fuquay Springs when people “came to take the waters” of the Mineral Spring. What was the finest hotel? From the record, the Blanchard Hotel with its turret and spire standing tall above the spring clearly stands out. Then what happened to the Blanchard? That is where the answers become harder. Research in the Independent has yielded nothing, although it is possible that the year 1940, which is one of our “missing” years, would provide that information. To date the News and Observer files have also yielded nothing. So what do we know? 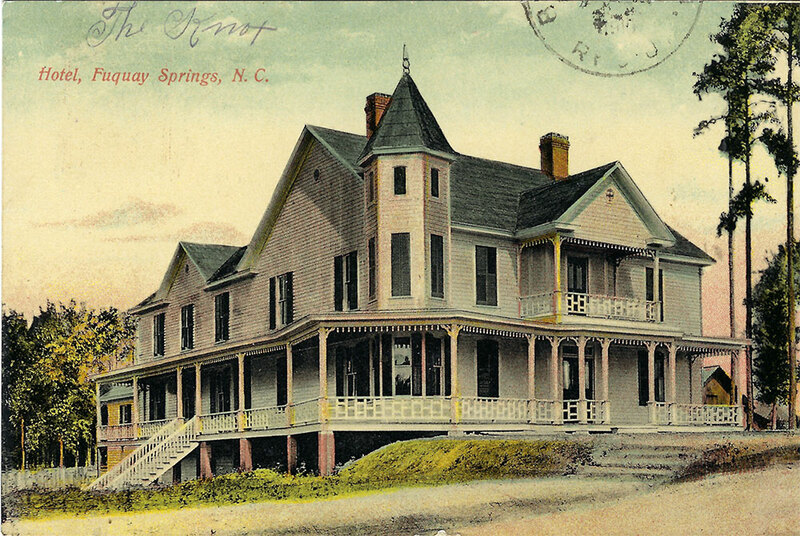 There is a color post card version of the hotel, mailed on June 10, 1910 from Fuquay Springs to a Charles Derhart in Beaver Falls, Pa. 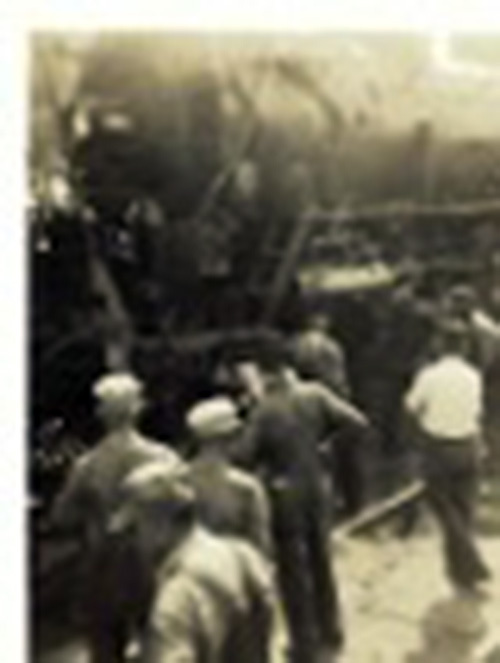 The writer identified himself as Isaac Griffis, 18 years old, a machinist, who plans to stay one or two more nights. While color postcards of the spring give fanciful views with ladies in frilly dresses and parasols and gentlemen sporting their finest suits and top hats, this postcard does seem to be an actual photographic rendering, on the top of which Griffis has scrawled “The Knox”. The U. S. Census of 1910 lists Wilton A. Knox as hotel keeper. Knox is recorded as having wife, Penny, daughters, Mary and Lucille and a son, Wilton. Finally, an early post card taken from the southern side of the creek, behind the old pavilion where dances were held, is clearly a photographic image. Note the scrawny trees, the old store hiding just behind the pavilion, and the Blanchard sitting high up on the hill with nothing growing around her. Comprised of two stories with a turret and attic and something of a basement under the back side, her porch overlooked the mineral spring. Skinny Ashworth says he can remember seeing people sitting on the porch looking toward the spring sometime during the 1930’s. The site was originally Fuquay family land. Part of the 93 acres inherited by Alrich Partin Fuquay from his father David Crockett Fuquay on the west side of what is now Main Street, it included the spring, joined the Jones land at the depot, and worked its way up the hill to above Academy Street today. A. P. Fuquay mortgaged his land to pay for his education at UNC Chapel Hill, then returned to town to teach in the Squire Ballentine School House located above the spring. When the school closed about 1892, he left town and moved to Georgia. His property was handled by his brother and acquired by Dr. J. A. Sexton in 1898. Maps show Sexton’s plan for lots on Spring Heights and up Main Street. Lots # 5, 6, & 7 of his platt were sold to A. G. Blanchard and his wife Maggie. Henceforth, these three lots are identified in the records as the “hotel property.” Blanchard built and named this fine structure. Arthur Gibson Blanchard was a son of Dr. A. J. Blanchard and Harriett Rowland Blanchard who lived on what is now Highway # 55 or Broad Street across from Windsor Point. Maggie was the daughter of B. G. Ennis who owned the property along what became Broad Street. They had no children; however, there were other Blanchard descendants in Fuquay-Varina. and a nephew called “Gib” who was named for him. Whatever the financial success of the Blanchard Hotel may have been, the Blanchards mortgaged this property and others to the Trustees of Wake Forest College September 25, 1911. Branson’s North Carolina Business Directory lists the Blanchard hotel each year; however, in 1915 it is identified as the Myatt Hotel. Again an inn keeper’s name is associated in this photograph showing more landscaping of the grounds around the hotel. To date we have no identification of the Myatt innkeeper’s name although there were many Myatt’s in the Willow Springs area. In any event, the hotel ownership remained with the Blanchards. The Treasurer of Wake Forest College, Talcott Brewer, acknowledged by affidavit in 1923 that the $900 note on the Blanchard Hotel was still unpaid. Finally, the Trustees of Wake Forest officially sold the property to Hattie Hill Williams and husband Joseph Speed Williams in 1935. The Hills were from Louisburg and the Williams from Warren County. Their intention was to restore the hotel as a tourist attraction according to their grandson. To date, we have located no clarity on whether the hotel was then open or was closed. These were depression years across our nation. The Ben-Wiley Hotel across the street was opened in 1925 by the Cozart family and the Barham-Bullock Hotel still operated. In 1937, Mrs. Williams conveyed the hotel property to her daughter, Elizabeth Williams Rowland. Elizabeth, at 18 years of age and a student at Woman’s College in Greensboro, met and married handsome Walter Elton Rowland, son of Walter Lee Rowland of Fuquay Springs. Grandmother Williams died of cancer in 1938, according to Walter Speed Rowland, son of Elizabeth. Walter Speed (of Delaware) has visited the museums and was himself delivered by Dr. Cozart. The Williams family attempted to sell the hotel to a Mecklenburg couple and then bought it back. When the mortgage on the hotel defaulted and the property reverted to the Trustees of Wake Forest College, the college auctioned the property at the courthouse in Raleigh in March of 1940. E. P. Hough purchased the hotel property for $1200. 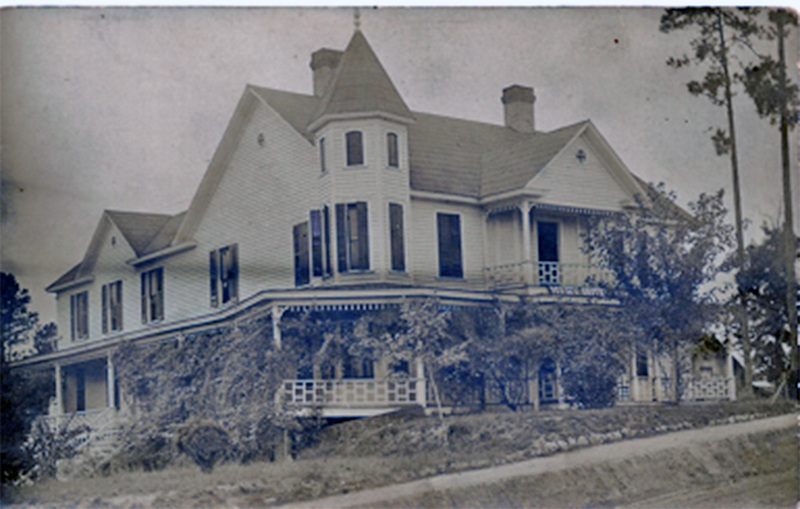 Mrs. Pauline Holt Cozart and her husband Dr. W. S. Cozart acquired the property from Hough on October 17, 1940. What happened to the hotel building? Walter Speed Rowland assumed the hotel burned but cannot verify this. Rupert Weathers ( a descendant of the Blanchard family) remembers playing in the closets of the abandoned hotel building as a boy. 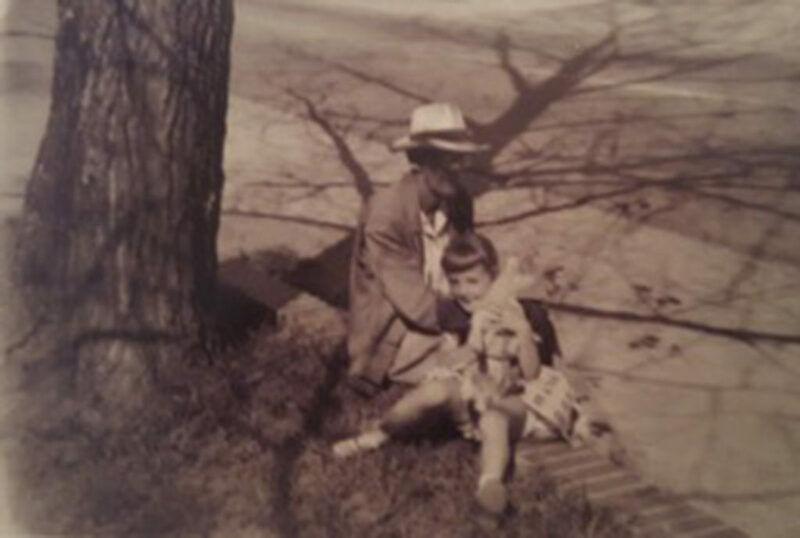 Sara Fish Ragan and her good friend Patsy Cozart Patrick both told us in separate interviews in 2019 that they seem to recall the building being demolished around the late 1940’s. At this juncture it does appear that the hotel property was cleared for individual building sites which remained under Mrs. Cozart’s ownership until 1984-85. Since that time there have been a number of owners of these properties. If you want to locate the hotel property today, the first of these houses is scheduled to open as Piedmont Pottery, the second building is rented and occupied by Loving Loft, and the third, still a rental dwelling, is owned by Patty and John Byrne. The Masonic Hall is not located on hotel property but rather was the site of the older store which shows in the pictures between the mineral spring and the Blanchard. Speed Riggs, a native of North Carolina, was quite a big name in the history of tobacco and even in philanthropy. Not many people are aware of his connection to Fuquay-Varina. Probably only a few people who have visited the museums are even aware of his being a feature in our Tobacco Case. We even have his “Lucky Strike Means Fine Tobacco” LSMFT on tape in our audio visual collection. But just in case you come or you won’t come, let us tell you more of this interesting gentleman. Lee Aubrey Riggs, the son of Mark and Callie Riggs, was born on Feb. 18, 1907 in Onslow County North Carolina. There three boys and two girls grew up on tobacco farming but moved to Goldsboro where Mark worked as a carpenter at times, too. At Speed’s death on Feb. 1, 1987, only two sisters, Beatrice Riggs Godwin and Reba Clell Riggs survived him. By the time he was 17, Lee had perfected a sing song chant partially to the tune of “Yankee Doodle Dandy” and told News and Observer columnist, Dennis Rogers, that he could do 590 words a minute by that age.” Now, you know why he was called “SPEED.” The average auctioneer would do somewhere between 300-400 words per minute according to some sources. Rogers recounts that at 18 years of age, Lee tried out for a position as a Goldsboro warehouse auctioneer along with 4 other men. The crowd was so impressed they yelled, “hire the kid.” The warehouse did and Lee became the youngest tobacco auctioneer in the country in 1935. L. A. 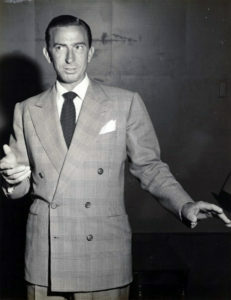 “SPEED” RIGGG, according to his relatives, always appeared dapper in his double breasted suit jackets. Speed never made a living selling tobacco thereafter. Rogers credits him with earning $450 a week as a national celebrity at 20 years of age. The final line, “sold to American” became his trademark. Shortened to “LS/MFT,” everyone knew the commercial. He traveled the country giving interviews and speeches and doing charity auctions for Lucky Strike. During World War II, Speed sold $218 million in War Bonds, including $7 million in one day on Boston Common. According to Rogers, Speed appeared in 11 movies. Another account credits him in 8 movies with Dale Robertson and 7 movies with Glenn Ford. He has pictures in Hollywood with Sinatra and many others. Now for the Fuquay connection. 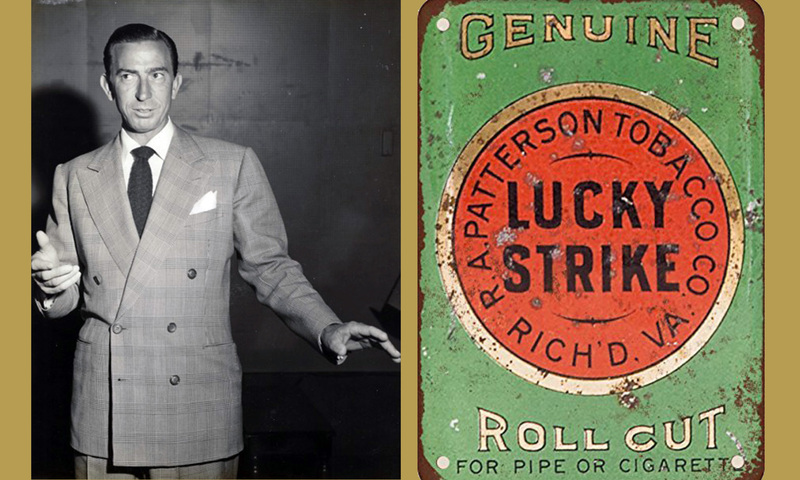 During his two years of work before becoming the Voice of Lucky Strike, Speed sold tobacco in Oxford, Fuquay Springs, Whiteville and on the burley market in Tennessee. Riggs roomed at the Ben Wiley Hotel with Sam Amos and was friends with Bruce Howard who did the calculations on the local market. While in Fuquay Springs, he met one of the fair young maidens of Varina in Wake County. Walter and Lola Dennis, having lived in Neills Creek, Harnett County in 1910 and in Chatham County in 1920, had moved to Fuquay Springs by 1930. 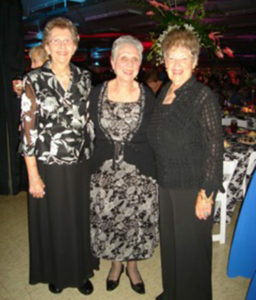 Their family included the four Dennis girls: twins, Lucille and Kathleen, and the two younger ones, Myree and Nora Belle. 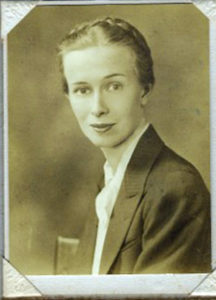 Nora Belle Dennis married Speed Riggs in Fuquay Springs in 1937. A beauty, Nora Belle caught the eye of Speed Riggs and they were married on December 29, 1937 by Rev. C. H. Norris, Baptist Minister. Bruce Howard, later Mayor of Varina, and long time tobacconist, signed as a witness. Nora Belle and Elizabeth Howard were good friends from school days. Among the Dennis girls, Kathleen would marry Bill Byrd and this collection of material to the museum comes from her son, John Robert Byrd. Myree married Robert Williams and their children are Robbie Williams and Jane, still residents here. Lucille worked as a postal clerk. Married twice, she eventually lived in California. The Riggs couple made their way to California, living in Fullerton, Anaheim, and owning a ranch at Resada on which Speed raised saddle-bred Palominos. At some point they were divorced and Nora Belle remarried. There were no children. Nora Belle died in 1985. When the cigarette commercials were banned on radio and television in 1969, Speed formed a non profit called “Your Community Fund.” His purpose was teaching job skills to the handicapped and under privileged. 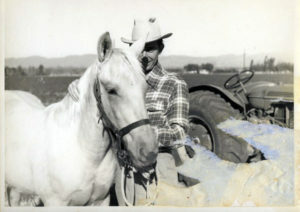 Riggs raised Palominos on his ranch in California. Ill health prompted Speed to retire to North Carolina in January, 1986. He lived with his two sisters in Rocky Mount and later in Goldsboro. When he died on February 1, 1987 in Goldsboro, his memorial service was delayed until the following Saturday, February 7. 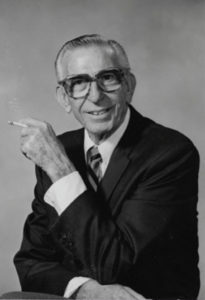 Among the speakers listed in the program was W. W. “Billy” Yeargin, President of Tobacco History Corporation and later a featured speaker across the state. Other dignitaries sent remarks according to the program and clippings kept by John Robert Byrd. Speed served as one of the judges at the first annual tobacco auctioneering championship in Danville, Va. on Sept 12, 1969. Actually, the writer notes that the first auctioneer began his art in Danville in 1858 with the first loose leaf sale. Auctioneers held Speed in great acclaim across the United States. In 2003, Lee Aubrey Riggs was entered into the North Carolina Agricultural Hall of Fame. 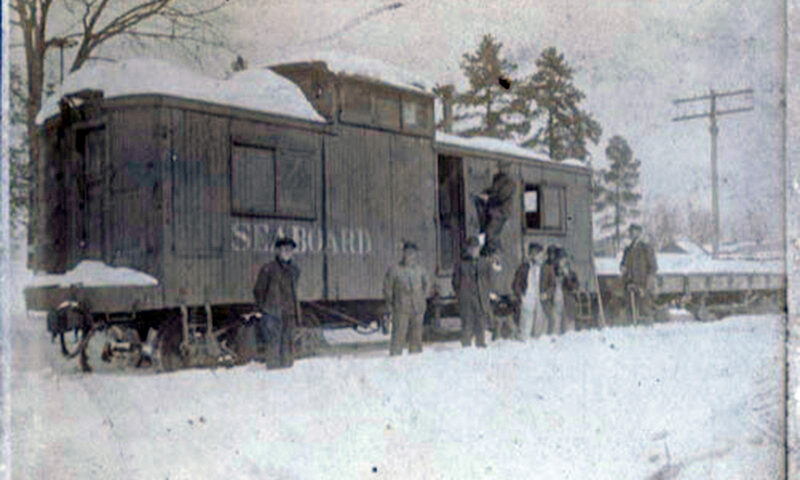 Can you identify this caboose on the Seaboard Line? In what snowfall? Definitely a wooden caboose—— what else can you tell us? a family in the house at the corner of Main and Ennis Street. 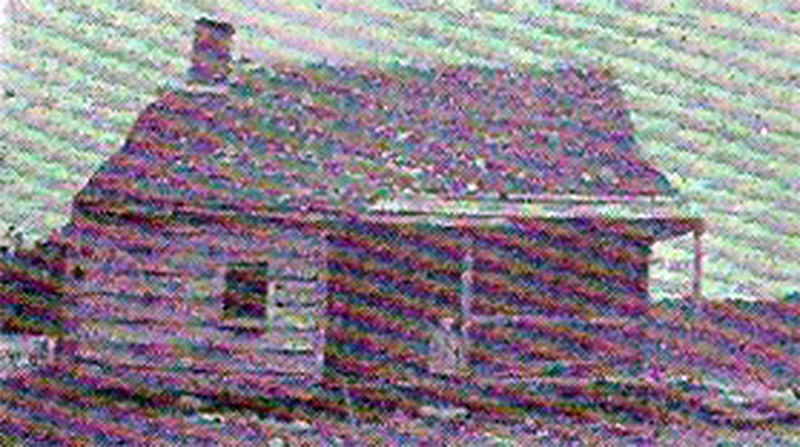 Later the home of William “Bill” Byrd and Kathleen, it was recently torn down. Included in the collection are these three small photos, also open to identification by experts! Since the museum staff continually receive this question, we have spent some time in research. Our aim is to preserve the history of this building from the early era as it is about to take on life as a new entity entirely. There are a few pieces of information we still seek and we are open to any other occupants of the upstairs whom we have not uncovered in our research. David Grayson Senter and wife Grace C. Senter bought the property on Vance Street, April 6, 1948 and constructed the two story brick structure to house their building supply business. In 1948, on the first floor, they sold building supplies while they leased and/or rented the upstairs to various other establishments and group. Their original building supply business on this site operated slightly over one year. WFVG, “Watch Fuquay Varina Grow,” the brain child of Starlon Adcock seems to have been the first tenant upstairs in December of 1948. This radio entrepreneur had Adcock relatives in Fuquay and Wilbon. 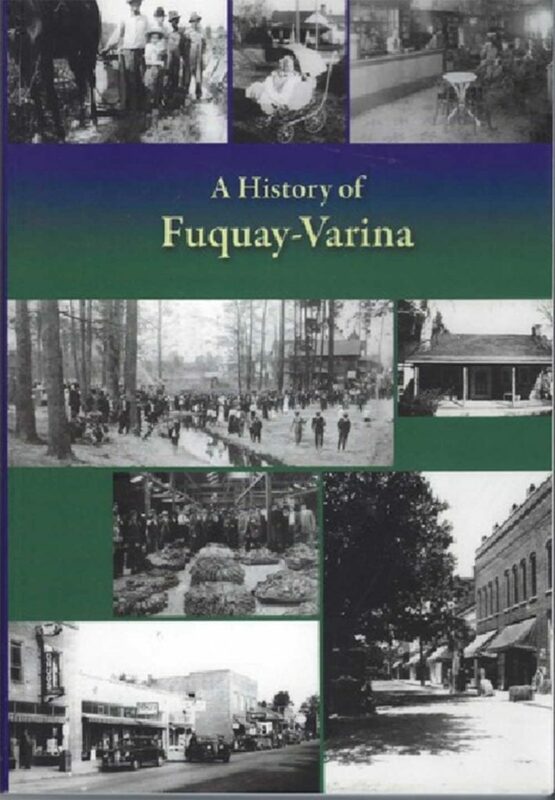 (Notice that Fuquay-Varina as a designation is one of many which predate our official 1963 change of names.) Dorothy Adcock Elliott Mays, a niece of Starlon, remembers singing on Sunday radio in broadcasts by the Piney Grove Baptist Church Choir. Her description is one of “going up some steep steps” and in truth, the entrance ascended from Vance Street on the left of the building. WFVG was sold in January, 1949 and about six months later moved to Highway 55 West where the Broad Street Shopping Center is today. The Fuquay Masonic Lodge # 258 signed a lease with the Senters for some upstairs space on May 13, 1949. The Masonic Lodge apparently continued to occupy quarters there until they moved to their new building on South Main Street. Laying a cornerstone for the present lodge building on October 6, 1960 (construction began in July) the Independent article notes that the Masons “had been meeting for several years over Hudson Belks.” Indeed, the Eastern Star had met there, also. The new Masonic Lodge was dedicated October 24, 1961 and thus the lease for the Vance Street site would have ended in that time frame. When the Hudson Belk Company became the first large “outside” corporation to move into Fuquay Springs they leased the first floor of the Senter building located on the north side of Vance Street between Fuquay Avenue and Main Street. The lease was to run for five years. 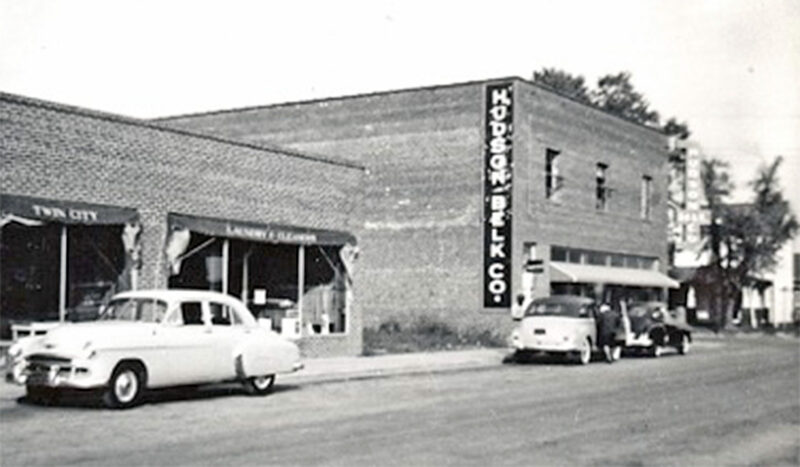 Hudson Belk opened for business on August 29, 1949. The museums acquired many ads for the store for its archival collection, among which is a copy of the sales items for that opening date displayed for our visitors. By the end of December, 1949 the Hudson Belk Company had acquired property from Woodrow and Zazelle Johnson on Raleigh Street. The company was clearly intending to become permanent. When Hudson Belk arranged to purchase the building from the Senters on May 17, 1950 there were several provisions. There was the stipulation that the leases to the Masonic Lodge and WFVG for upstairs space remain in place. Another referenced the agreement on the Western wall on the lot owned by C. S. McCauley and G. W. Scott. 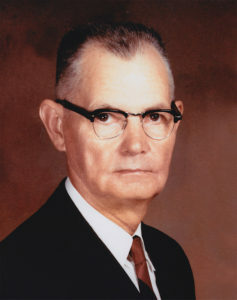 Optometrist Dr. A. N. Johnson opened his first office in Fuquay in upstairs quarters leased from Hudson Belk on July 7, 1950. His son Robert, Dr. Bob, was born exactly one week later, he remembers. The Johnson firm would vacate and move to Depot Street in 1953. Another large corporation appeared on the Fuquay Springs scene in February, 1951. Cornell Dubilier, an electronic company, began operations in a portion of the upstairs of the Belk Building. The corporation had signed a lease with Talley Brothers, Proctor Barbour Associates for the Farmer’s Warehouses #1 & #2 on Jones Street January 31, 1951. That 80,000 square foot space would become the home of Cornell Dubilier when the warehouse remodeling was completed. When Cornell Dubilier celebrated their Fifteenth Anniversary in 1966, they recognized a number of employees who began their operations and planning over Hudson Belk. By November of 1951, Hudson Belk desired more floor space. The company then arranged for the construction of a “good substantial” one-story addition which would become their men’s department. 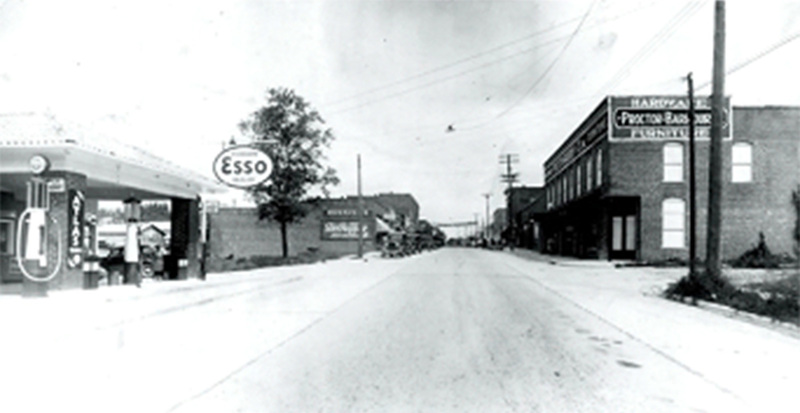 A. Y. Hairr, local builder, constructed the brick building bounded on the East by Hudson Belk’s two story building and located between the Twin City Laundry and Cleaners building on the West. The final sale of this property to the Hudson Belk Company by McCauley and Scott was completed in 1966. Prior to this conclusive sale, Hudson Belk had added some alley property beside and behind the original store and this new property. 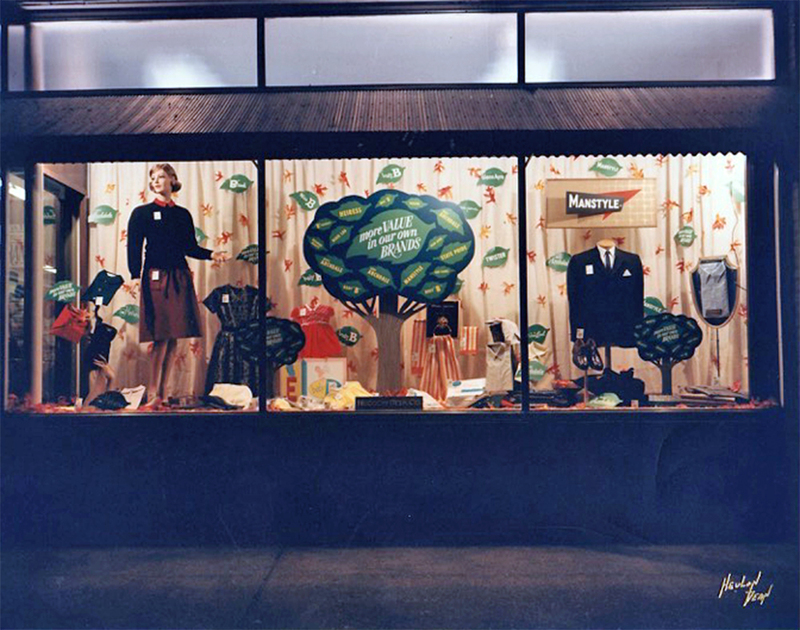 Hudson Belk’s manager, James Avery, announced in the January 1, 1953 Independent that it had remodeled the store, with new tables and sales operation. Another interesting ad of March 19, 1953 shows Hudson Belk’s civic mindedness. Employees of Cornell Dubilier, Wake Manufacturing, and other local industrial firms are advised they may cash their pay checks at Hudson Belk. The store will have enough funds to provide this service for those who may not have local accounts in town or who may wish to shop at Hudson Belk. By 1960, Hudson Belk managers are announcing another civic minded operation. College Scholarship applications provided by the Belk Foundation are available for high school graduates who wish to take that opportunity. Eventually Hudson Belk ceased to lease space upstairs and incorporated this floor space into the main store. Upstairs access was from a new indoor stair case between the floors which many later customers will remember. Interestingly, the clearest reference we can find within the Independent regarding Hudson Belk’s occupation of the entire building is a two page ad spread. Thursday, March 15, 1962 was Belk’s Grand Opening of their newly remodeled and enlarged facilities. Heulon Dean photo after the 1962 grand opening of Belks showing the window on Fuquay Avenue side. When Hudson Belk officially closed the Fuquay-Varina store on January 29, 2010, an era ended. With the availability of the building, Verian Properties picked it up the following December. 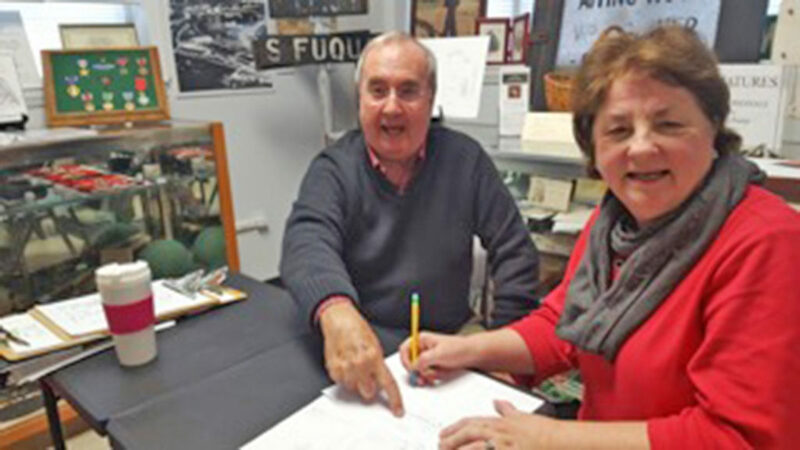 Their establishment of local theater and dramatic arts culminated with the sale of three pieces of property to the Town of Fuquay-Varina in 2015. The rebirth of the Hudson Belk Building for the Fuquay-Varina Cultural Arts Center begins a new era for this historic property. *Note about banner photo: Door just beside the sign leads to the upstairs entrance. Space between the two buildings dates this before the construction of 1951 addition. Courtesy Philip Honeycutt to Museums. To borrow from Paul Harvey, we have some of “the rest of the story” to share. After our Historically Speaking account of the Angier bank robber who was arrested by W. T. “Pete” Tyndall in July of 1957, one of our docents, Gail Amos Woolard excitedly told us that she was an EYEWITNESS to part of this incident. We arranged for her to come into the museums and surprise Bryant Tyndall with her additional information. She began so professionally by sketching her memory of Ennis and Main Street and explaining the total of her grandparents’ home and neighborhood. It took Bryant a little while into the story before the light bulb went off and he realized that she was telling him about the same robber his father had encountered. The rest of us learned a great deal more about the intersection of Main and Ennis in 1957: events, people, and properties. Gail Amos Woolard and parents, Sam and Flora Amos, lived on Ennis Street near the corner with Main in the home of her grandparents, the Wingate Howards. The house was located where CVS is built today. Next door on the south corner of Main was a Crown station run by the Laniers which the Amos family had dubbed “the glory hole.” Always, the station was abuzz with “news” reports. Directly behind the station, Granny Howard’s yard had a gold fish pond surrounded by a small flower garden. 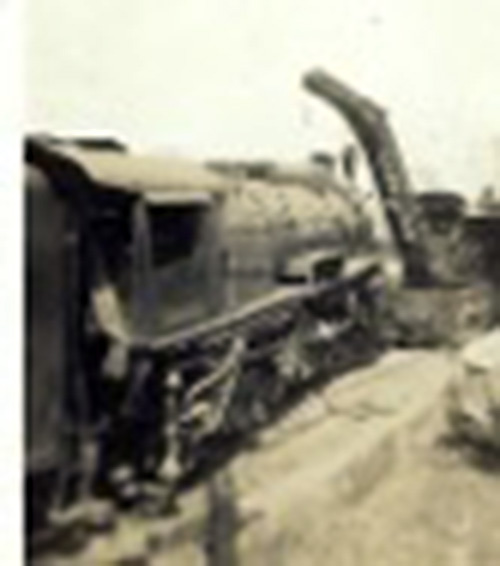 The station corner itself was a partially paved area, loosely covered in sand. Along the Howard property line was a low brick wall on which Pops Howard often sat and visited with passersby. On the west side, the property bordered that of the N S Railway. To everyone’s surprise: Howards, Amoses, and Sneads— all watched as the fleeing robber lost control in the intersection and plowed into the Howard’s wall. They all watched him jump out of the car and take off running to the south. Adventurers that they were, Gail and Sammy gave chase to see where he was going. She remembers running down into the Perry Howard back yard and across the Hopson property next door. Later Mrs. Hopson would become her school teacher but at this point she can still hear Miss Myrtle yelling, “Get out of my yard,” and surmising that she was going to be in trouble with the neighbors for this trespass. The intrepid pair continued through the Faucette Steet vicinity, reaching the arrest scene at the Ice Plant, then located on the distinct paved area near the First Methodist Church, just in time to become eyewitnesses. Pete Tyndall was drawing a bead upon Whitaker with his gun. Gail remembers Tyndall’s clear yell for the robber to stop. Next she recalls some sparks in the air, followed by the sight of blood on the robber’s cheek. Her surmise is that the bullet ricocheted off something and glazed Whitaker’s face. Ironically, Bryant says that his father had never fired the gun prior to this. Gail saw Tyndall handcuff Whitaker and heard that he was taken to Dr. Crumpler for treatment. She doesn’t recall how she returned home, perhaps the adults had realized the situation and followed them. She does recall that the talk of Varina was “that Pete had shot the robber.” She doesn’t know whether Whitaker’s personal getaway car was stashed at the Ice Plant or nearby or just how Tyndall happened to intercept Whitaker at that site. Her childhood memories of Pete Tyndall as policemen in Varina are vivid. She continually ran into him as she plied Broad and Ennis Streets and others on her bicycle. Varina seems to them to have been a child friendly place to live and explore. Having met and married Dale Woolard, she had many times recounted the incident as eyewitness to her husband. Dale knew Worth Whitaker as a resident of Hilltop Road in Garner. Neither of them recalls how much of the twenty year sentence Whitaker actually served in prison. Some twenty years later, Gail and Dale was eating at Toot-n-Tell It on Garner Road, when Dale pointed out “that man over there is your robber.” Gail recalls the scar on the side of Whitaker’s face at that time. Whitaker apparently lived out his life in the Garner area and became friends with Pete Tyndall just as Bryant remembers. Gail, the child, just never associated her “Pete” Tyndall with W. T. Tyndall, father of Bryant. Now the two are continual sources of VARINA LORE for all of us at the museums! Perhaps there could be more of “the rest of this story” out there! 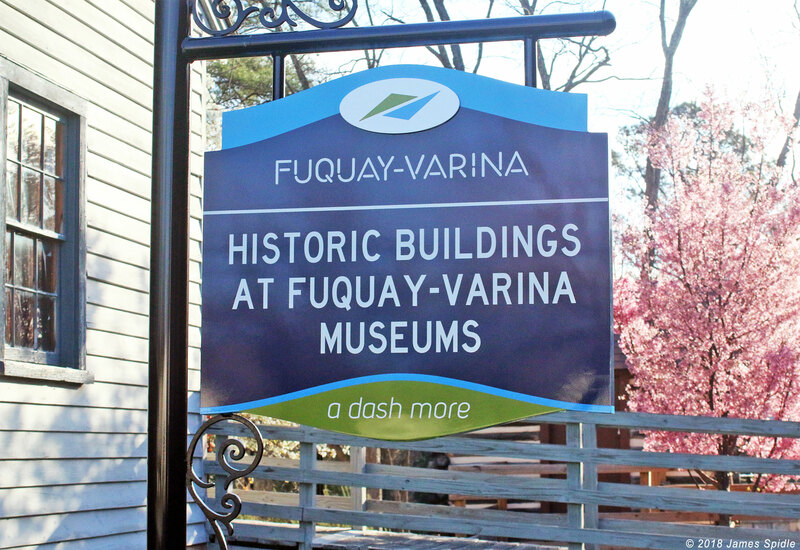 The Fuquay-Varina Museums staff often receives requests for help with information and research. 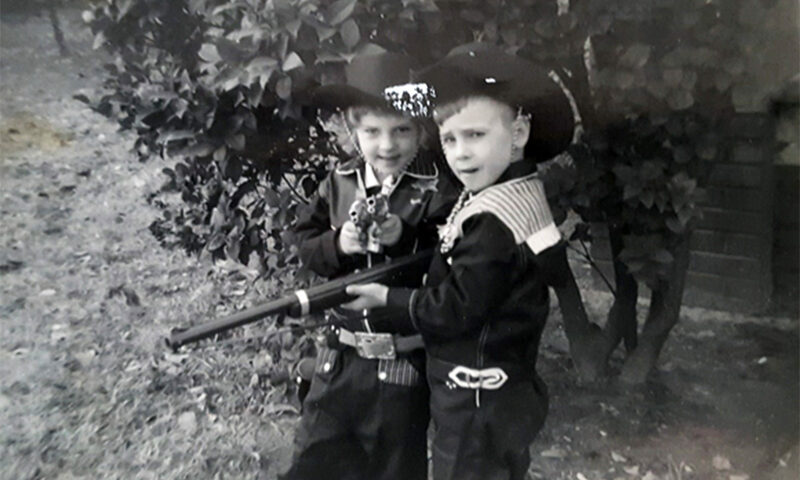 Recently two sons of former Police Chiefs have come in on such missions and this had led to unraveling some interesting tales from the past. One of our regular docents (he prefers tour guide) Bryant Tyndall is the son of W. T. (Pete) Tyndall. Policeman Tyndall is noted as an extra on the police force in 1950, served Varina as the night policeman in 1951-52 and was temporary Chief of Police July 15, 1952 while William Vaughan took a month off to harvest tobacco. 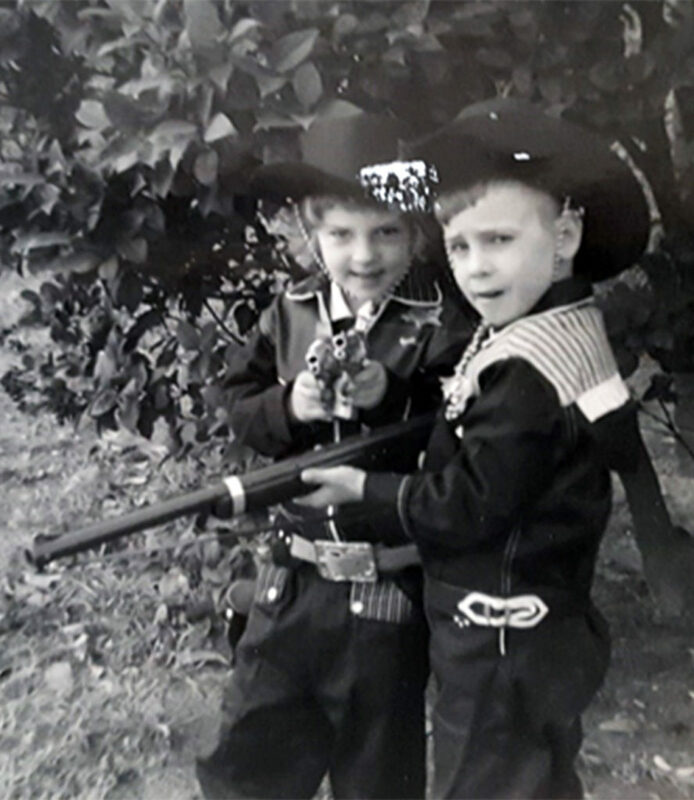 From his youth, Bryant was interested in the bank robbery experience of his father as a town policeman in July of 1957. Worth Whitaker, 41 years old from Garner, decided to hold up the “much robbed” (Independent’s words) Angier branch of First Citizen’s Bank and Trust of Smithfield that July day. This was the 3rd time this bank had been robbed since 1950. The previous week, robbers had taken $30,000 from the Bank in Apex. Whatever his impetus, Whitaker later said he ”didn’t know why” he decided to leap into the life of crime. Fuquay police were alerted by bank cashier, Haywood Hall, who chased the robber to Fuquay. At the time of the robbery, Hall was out to lunch leaving Teller Ben Price and clerk, Brookie Cotton to confront the robber. Whitaker had his hat pulled down over his eyes and asked for change for a $5 bill. He then handed them a satchel and told them to fill it up. The change at the window amounted to $12,392 all of which Price stuffed into the satchel. Hall returned and opened the door, but when Whitaker motioned for him to come in, he realized there was a problem, slammed the door and ran to his car. Alerting the police, he gave chase when Whitaker fled in a car. Whitaker abandoned the get away car he had stolen intending a planned escape to his own car which he had stashed in Fuquay. That’s where Tyndall entered the picture. “I ordered him to stop several times and he kept going, so I shot him,” Tyndall related. Whitaker was shot in the jaw, treated locally by Dr. Crumpler and rushed to a Raleigh hospital into which he walked under his own power. Bryant remembered the commendation from Hoover and something further. After whatever time Whitaker served for the crime, Officer Tyndall and Whitaker met and became friends. 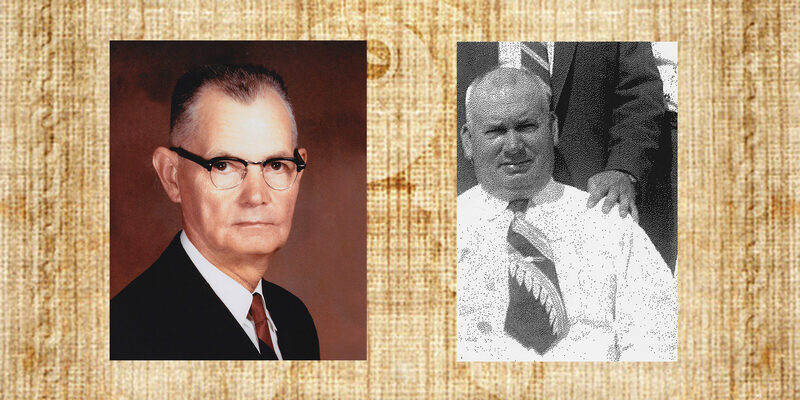 Bryant remembers the reconciliation of these two men from his boyhood years. Our second son of a former Chief of Police came while we were trying to uncover the story of Tyndall’s experience. Norwood Pritchett was seeking to discover a story of his father, W. L. Pritchett and a robbery of which he has sketchy memories. Pritchett is first noted as serving as a daytime policeman during tobacco season in 1947. Town records show he was employed on the force June 10, 1949. From June 4, 1951-July 15, 1952 he served as Chief of Police in Fuquay Springs. 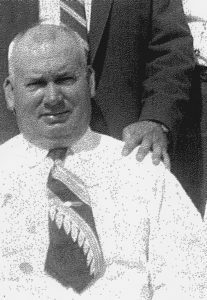 After a stint with the Wake Sheriff’s Department, he again returned to be Chief of Police in Fuquay Springs from May 10, 1961-September 1, 1961. For career reasons, he resigned and returned as a Deputy with the Wake County Sheriff’s Department. Norwood has a picture which he connects in his memory with a robbery incident. We are still working on confirmation of the Pritchett story. Hopefully this may prove a later tale to recount. 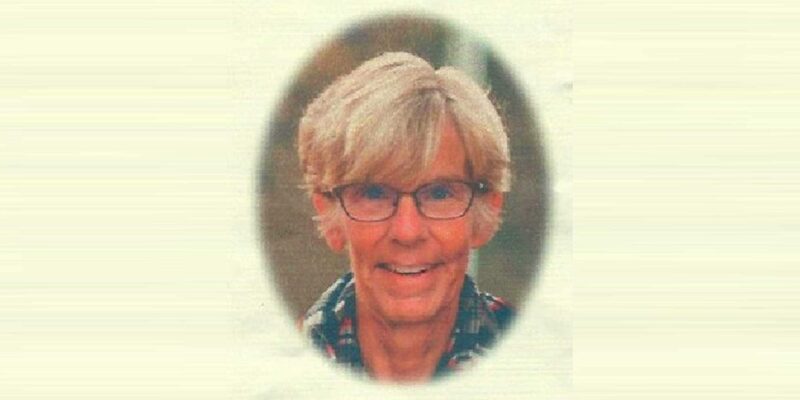 Our good friend and a member of our Friends of the Museums Board has left us for her eternal home. Her leaving has created a hole in our hearts as well as a vacancy on our actual Board of Directors. Eleanor Van Hook Stephenson has served on the Friends of the Museums Board since our first election at the 2010 beginning of our organization. Currently, she was Vice President for this administrative year. In that role, she rushed to meetings at 8:30 a.m. so she could be ready to open David Anthony’s at 10:00. For special projects, she often came after her closing at 6:00 p.m. But our greater debt to Eleanor lay in the many things she did in support of the Friends of the Museums. Her service actually dates from the Centennial Year when she provided us a venue to sell History of Fuquay-Varina, our Centennial Calendars, Notecards, and our T-shirts and sweatshirts. Never taking a penny for her efforts, Eleanor often lost money when customers paid by credit card . When a design was accepted for Centennial T-shirts and sweatshirts, she sold them in competition with her own merchandise. Beginning with our first order of 1000 books and our second reorder of 500 books to the Centennial Commission, Eleanor never complained and always pushed the sales of items to support the museums. We should add that this was true of Elliott’s Pharmacy, S & K, and other establishments who supported the F.V. Centennial Commission with enthusiasm. Eleanor was a cheerleader for our Fuquay-Varina Museums! She promoted the museums at every occasion. Visitors often came directly from her store, or as a result of her suggestion to them. 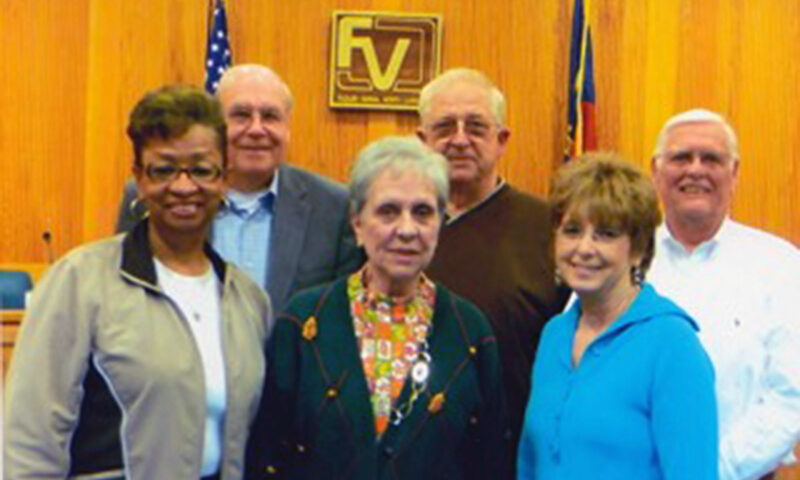 Daily, Eleanor was a one woman spokesperson for Fuquay-Varina! What would happen if we all emulated her life of giving: 100% support no matter at what cost to ourselves? The Museum continues to do research on topics which surface as we are working or as we receive requests for information. Recently, an interview with Eleanor Howard resulted in a “query” about a Robert Wadlow visiting town. We had found a reference in the Independent files about a “giant” coming to town, so putting these two leads together, we are sharing our finding with interested museums fans. “Robert Wadlow, the world’s tallest man, will visit Fuquay Springs on Tuesday, December 5,” quotes the Independent of Nov. 30, 1939. Rufus S. Ashworth, whose establishment had opened in 1937, sponsored the visit. Mr. Wadlow arrived at 5:00 p.m. Ashworth had sent invitations to 5000 persons announcing the event. The young man also visited Angier on the same date according to the Independent. While we don’t know how many actually came to the local store, Mrs. Howard and Mrs. Sara Ragan both remember seeing the visitor. “He sat upon a truck,” Mrs. Howard remembers. Several of the Ashworth family also recall the visit. The young giant, who hailed from Alton, Illinois, was accompanied by his father who was a normal size of six feet. Young Wadlow was listed as eight feet nine and one half inches in height. Taller than anyone in the United States or modern world history, he is still regarded as the tallest individual for whom there is no refutation. His height came from a pituitary gland condition called hyperplasia. Continuing to grow until he died at the early age of 22 years, he was last measured at 8 feet, 11.1 inches. Because of his condition, he required braces to walk. His death resulted when a blister caused by the brace became infected. Research shows that Wadlow died on July 15, 1940 and was buried in Illinois. A life-size statue of him was erected in Alton in 1896. He intended to study law but because of his condition, he became a celebrity with the Ringling Brothers Circus. The two ladies believe that his appearance was connected to publicity for a shoe company. Indeed research shows that he did a promotional tour in 1938 for the International Shoe Company which provided his shoes. Wadlow was also a Freemason. Coincidentally, Mr. Ashworth was also a Mason and could have heard of the fellow Mason who required the largest Freemason ring ever made. The Friends of the Museums express our sorrow over the loss of our friend, Robin Gale Mangum Simmang. When taken from us on May 26, 2018, Robin’s sudden death created a hole in our hearts. The daughter of Betty Mangum and the late Richard Mangum, she grew up with one big brother, Dale. Much of her early life was spent around the world while her dad served his country in the U. S. Navy. 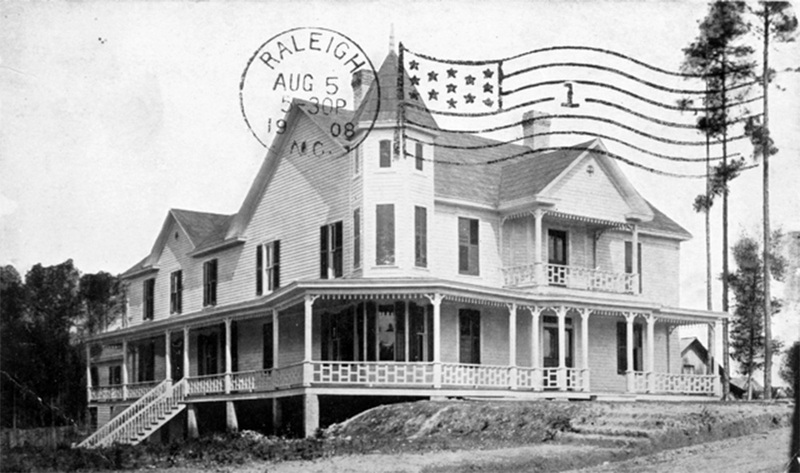 After retirement, the family settled on Ennis Street in Fuquay-Varina. Robin was a graduate of Fuquay-Varina High School. As President of the Junior Class, she and her dad worked on prom decorations, building a bridge for the picture background that year. Following graduation, she received an Associate Degree from Wayne Community College in 1979 and subsequently served our country in the United States Navy for nine years. These years enabled her to become an IT expert extraordinaire. Her military & civilian career were spent in the field of computers and technology but her life was invested in family, friends, church, and community. Our debt to her is immense. In 2009, she gave us innumerable hours of work as we wrote the History of Fuquay-Varina. Each chapter copy went to her along with the pictures we had associated with that material. Sitting with author, Shirley Simmons, Robin worked tirelessly to put each picture as nearly as possible with the narrative, wrapping text, moving text, and arranging text. Many pictures were of poor quality, but the only one available for the subject. These Robin spent time converting into the best possible pixels for print while tirelessly inserting the proper identification for each photograph. Careful proof reading, detail orientation, and error correction took hours. Often, at the last minute, an interview or research would provide some new material to be inserted. Her patience was endless. No record exists of the hours she donated to this effort. Finally, every chapter was completed and Robin used her expertise to prepare the entire material for the printer. Even the cover arrangement bears her imprint. Shirley Hayes wanted to pick her favorite pictures for the cover montage. Robin managed to lay them all out with care and exactitude. Hers was the cover color choice. Robin sent the book to press. After the book was reality, Robin worked with her son Chris Simmang to prepare the final version of our video history. Taking narrative read by David Caudle, they managed to place photographic images, even selecting and enhancing some, which fitted our story. The musical background was all Chris. He is his mother’s son, the epitome of patience and long-suffering. Upon the opening of the museums, Robin worked to set up the audio visual room so the public could enjoy the historical video production. Many times, in the first months, she served as the expert, helping docents to operate the projector. Even the first projector was borrowed from Robin. The Fuquay-Varina Museums has acquired a copy of a diary of Chaplain Alexander Davis Betts entitled “Experiences of a Confederate Chaplain 1861-1865. Edited by his son, William Archibald Betts, the diary is housed at the University of North Carolina. Rev. Betts was serving at Smithville (Southport) when Governor Clark enlisted him to serve as chaplain for the 30th North Carolina Regiment on October 25, 1861. Surviving the war, Rev. A. D. Betts, DD was renowned for his service to the Methodist Episcopal Church across North Carolina. The only member of his family to receive a college education, this fourth son of William “Billie” Betts and Temperance Utley Betts, was thrown from a wild steer and crippled at seventeen years. Educated at the University of North Carolina, he both taught school and preached. Upon his death in 1918, he was buried at Green Hill Cemetery, Greensboro, NC. William and Temperance Betts bought fifty acres in 1825 along Hector’s Creek in Cumberland County (later Harnett County) where they built a cabin and raised six sons and one daughter. The estate records, prepared by his son, Andrew, list William (1799-1843) and Temperance (1795-1876) and declare their tombstones to be near the chimney of their cabin. The museums are currently seeking to establish the site and find these tombstones. Numerous sites have been explored, but the graves remain illusive. William’s brother James Betts lived along the Raleigh-Lillington Road and was the grandfather of James Archibald Campbell, founder of Buie’s Creek Academy. William’s six sons in birth order were: Andrew (1824-1898), Allen ( 1827-1897), Alvin (1828-1910), Anderson ( 1830-1912), Alexander (1832-1919), Archibald (1836-1929). All six boys names began with “A” and each adopted a middle name or initial later in life. Daughter, Sarah Catherine Betts (1840-1859) completed the family. Sara married Henry Stinson. Andrew Betts served in the North Carolina Troops 31st Infantry and is buried at Apex Methodist Church. Our J D. Squire Ballentine’s second wife, Cornelia was the daughter of Allen Betts. The Rev. Allen Betts was buried in Oakwood Cemetery in Raleigh. Cornelia later married William Patrick Campbell, who had earlier served as minister at the Fuquay Springs Baptist Church. They are all buried in Oakwood Cemetery which is where she also buried our “Squire” Ballentine. Archibald married Emily and raised a family in Duncan area. A descendant, Aaron Betts, has given us the tobacco slide for our barn recently. A relative, Marie Jordan of Arden, NC has communicated with the museums seeking family information and the gravesites of Temperance and William. A relative, Don Betts, has supplied the museums with a copy of the Betts Genealogy prepared by Wilbur C. Betts of Raleigh. Descended from William Betts on the Isle of Wright, the first known Betts in Wake County appear to be Joseph & Andrew Betts. From Andrew, came William and James of Harnett County (then Cumberland County). The museums have uncovered an article on the ancestral home in the 1942 Independent. 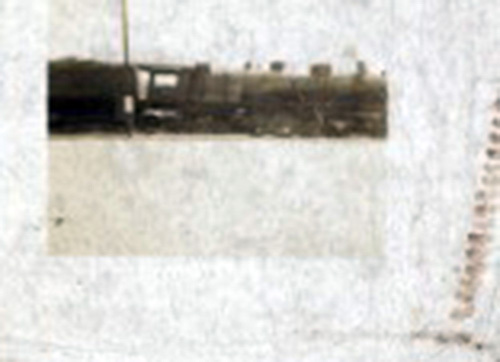 The picture states that Gordon Reuschling, Jr., a fifth generation descendant, stands on the porch. SO WE ARE STILL LOOKING FOR THE SITE of the house and the graves of William and Temperance. Has anyone seen these two tombstones somewhere along Hector’s Creek?